How much does it cost to travel to Goa? How much money will you need in Goa? ₨35,392 ($510) is the average daily price for traveling in Goa. The average price of food for one day is ₨504 ($7.27). The average price of a hotel for a couple is ₨69,366 ($1,000). Additional pricing is in the table below. These average travel prices have been collected from other travelers to help you plan your own travel budget. 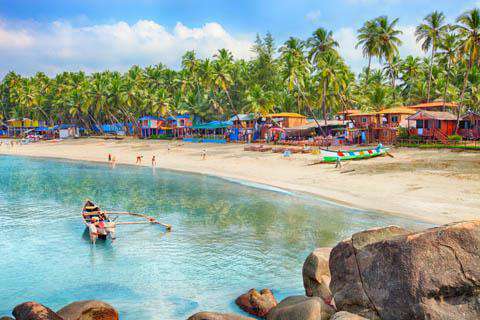 Goa is a small but important state located on the west coast of India. The population of the state as a whole is about one and a half million. There is a large Portuguese influence in Goa, as it was formerly a Portuguese colony. Because of Goa's Portuguese history, there is a distribution of religion among the people, making it quite different than other states in India. About sixty-five percent of the population is Hindu, while about twenty-four percent is Catholic. Goa is one of the most peaceful states in India, with a very low crime rate. The best time to visit Goa is between November and February, as this is when the weather is most comfortable. Many galleries and museums can be found all over the state of Goa. The Goa State Museum, the Kala Academy and the Central Library are all located in the city of Panaji. The Naval Aviation Museum is in Vasco de Gama, where you can see many vintage aircraft's. Beaches are plentiful in the state of Goa. Arambol Beach is located in North Goa where you can part take in many thrilling water sports, get a massage, shop at the market or just take in the beauty of the horizon, especially at sunset. Palolem Beach is located in South Goa, there are many cliffs and islands off the shore. Chapora is a fishing beach, where there are also ruins of an old fort. Churches and cathedrals in Goa due to its Portuguese history. Bom Jesus Basilica was built in 1605 with a distinct baroque style of architecture. Se Cathedral was built in 1619 and is one of the largest churches in all of Asia. The church is dedicated to St. Catherine of Alexandria. The cathedral serves as a memorial of the victory of the Portuguese over the Muslim rulers. Naturally, many temples can also be found in Goa. Shree Manguesh Shantadurgai Prasanna is one that has been dedicated to Lord Shiva. This temple is located in Priol. There are two main regions of Goa: North Goa and South Goa. Each region is then separated into further talukas. The northern talukas are Bardez, Bicholim, Pernem, Ponda, Sattari and Tiswadi. The southern talukas are Canacona, Mormugao, Quepem, Salcette and Sanguem. The main cities in Goa are Panaji, which is the state capital, Margao, Vasco de Gama, Mapusa and Old Goa, which houses many of the historic churches and monuments. Diving is a great activity off of one of the many beaches in Goa. Kite surfing and paragliding are also very popular beach activities among tourists. There is a butterfly conservatory in Goa, in Rajnagar. This conservation project is open to visitors where you can witness many butterflies as well as a rainwater-harvesting project. There is a flea market in Anjuna worth visiting as well as many discos and pubs, perfect after a long day of exploring. There is an international music festival that happens at the end of January at Baga Bridge. The festival lasts for two days and has many rock and jazz bands. The most traditional Goan meal consists of rice and fish curry. The cuisine in Goa incorporates local and Portuguese flavors. The cuisine in Goa mostly consists of seafood, more specifically pomfret, tuna, shark, mackerel, crab, prawns, lobster, mussels and squid. For a sweet treat, Bebinca is very delicious. It is made of coconut milk, egg yolk and flour. Many of the beaches have restaurants that serve traditional food, which is much better than the fancy, upscale restaurants. Feni is a type of liquor that is brewed in Goa. The two types of feni are cashew and coconut; these brewing techniques were learned during the time that Goa had Portuguese rulers. There is one airport in Goa, called Dabolim, which is located in Vasco de Gama. Many international flights will arrive in Mumbai, though. Domestic flights are more common to arrive at the Dabolim Airport. From there, a taxi is the best way to get into the town of Vasco de Gama, unless your hotel offers free shuttles. Taking a bus is another great option to get to Goa. There are many buses that travel from major cities in India to Goa. Indian Railways connect Goa with direct trains from Delhi, Ahmedabad, Mangalore, Mumbai, and more. As far as getting around, keep in mind that Goa is a state, not a city. So for each city within Goa, there are different means of transportation. Motorbike, bus, car and foot are the best ways to get around each city.